Postponed to a single-day event, Saturday, October 13th! 150 Wines, 25 wineries, 45 artisans, 25 food purveyors, live music. Rain or Shine event. Sample wines in your commemorative wine glass included with general admission. VIP tickets available. Enjoy the live music and beautiful country setting. Fantastic food and juried artisans. 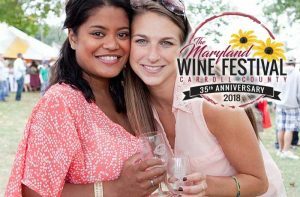 Parking available on site with free handicapped-accessible shuttle bus service from Carroll Community College and the Carroll County Office Building.